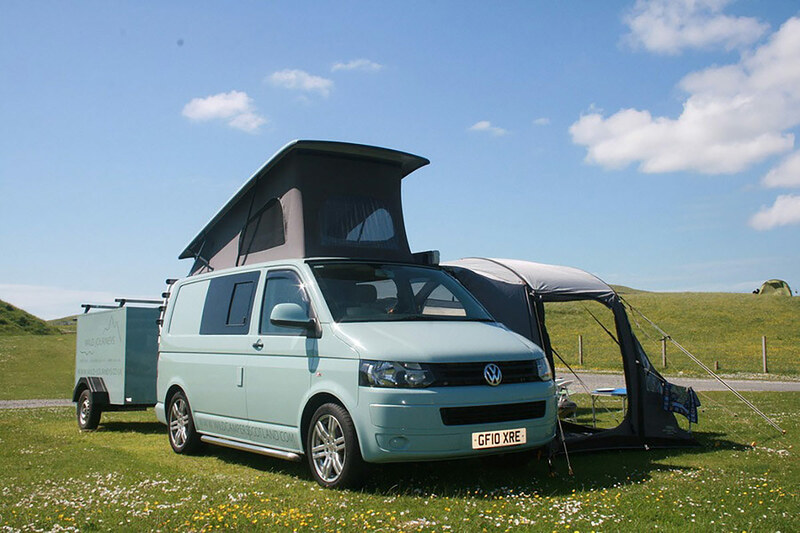 Finn is a 2010 Stone Blue VW T5 camper van available for hire from Oban and Mull, Scotland. Powered by a 140BHP 2 litre diesel engine Finn is no slouch but he’s also economical. A six speed manual gearbox means you’ll get around 35 – 40 MPG on the open road. That translates to about 700 miles on a full tank. He was converted during 2014 to a unique and high standard. Up front he’s got twin captains seats that swivel round to face the back when you’re camped up. There’s air con, power windows & mirrors, reversing sensors and bluetooth for your phone or iPod. In the back there’s a RIB seat with fully integrated triple point seat belts and headrests. This seat folds down very easily and quickly to become a double bed. The RIB system has a great reputation for both safety and comfort. And of course there’s another double when you raise the Reimo pop top. During the day the bed folds up into the roof meaning you have full standing height. At bed time a one handed pull sets the bed up in seconds. Again, the Reimo is about as good as it gets when it comes to T5 pop tops. There’s a Smev cooker and sink as well as a super efficient and quiet Weaco fridge with a 48 litre capacity and a 5 litre freezer. Outside there’s a Fiama roll out awning to offer protection from the sun or, occasionally, the rain:) And, as optional extras we have two of the finest awnings on the market, a bike rack for up to four bikes, a Weber Smokey Joe BBQ and crisp, clean linen sets. We also offer transfers from both Glasgow and Edinburgh airports. No corners have been cut with Finn’s build. 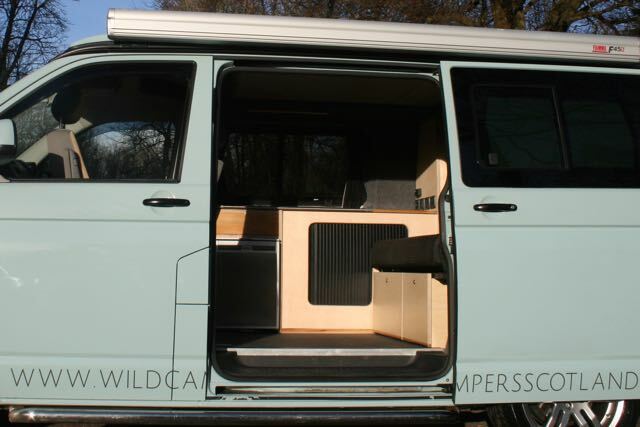 We’ve used the best components to convert what was a fantastic T5 into the dream camper van. We’ve built him with love and care – he’s been a long time in the dreaming! 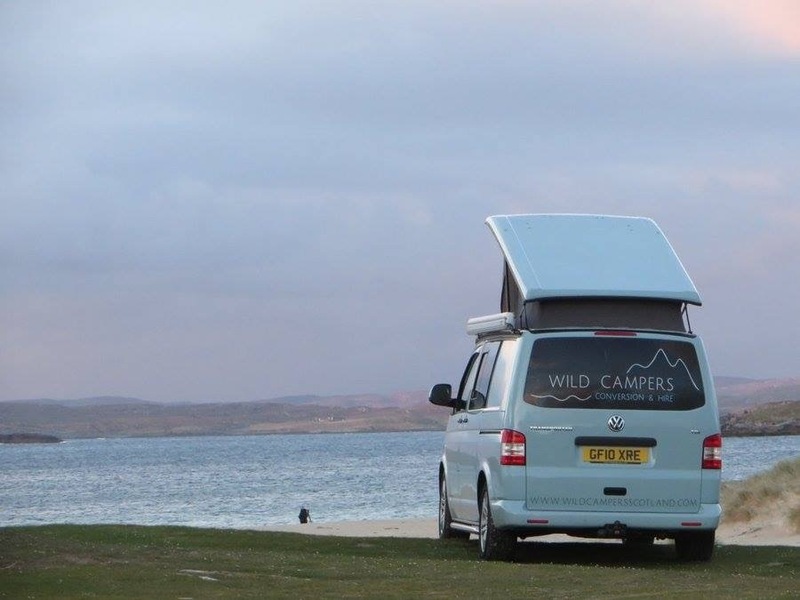 The VW T5 is the perfect camper van for Scotland’s smaller roads and ferries. 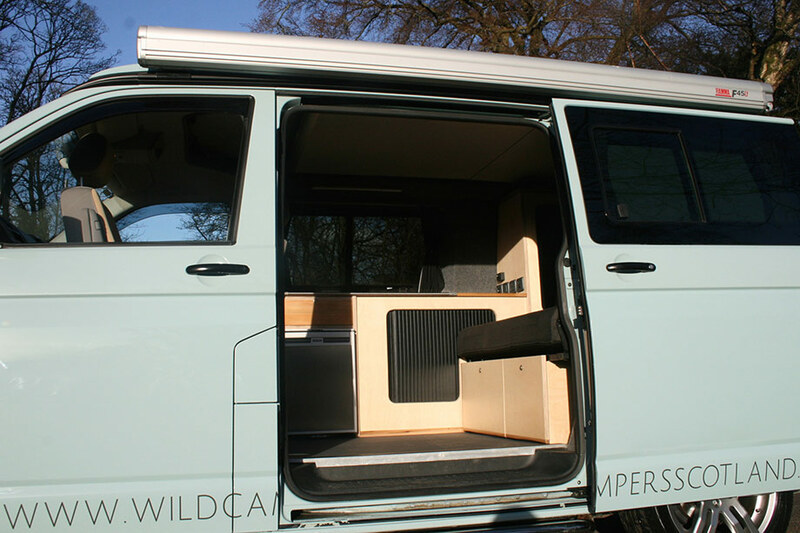 And in terms of T5 conversions Finn is about as good as camper van hire in Scotland gets. And don’t forget – not only does Finn come with free sat nav – he comes with free sat nav that is pre-loaded with great wild camping spots, walks and places to eat. You can see a side by side comparison of all van’s features here.